Beautifully crafted front leg strap/leg lifter made from chrome tanned harness leather and lined with seat belt webbing. Specifically designed to be wide enough to avoid it cutting into your horses fetlock or leg. The Angus Barrett Front Leg Strap is based on a design popular with New Zealand horse trainers. 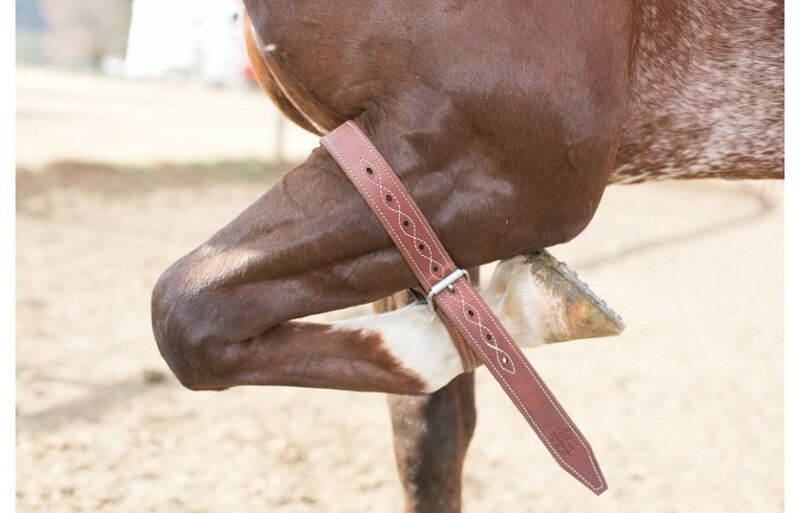 It is designed to go around the fetlock of a front leg and up over the forearm to hold the front leg up. Angus recommends it for young horses that tend to paw. The strap is designed to be wide enough to avoid it cutting into a horse's fetlock or leg and it is made from quality Hermann Oak Harness leather which will soften up with use, while still maintaining its strength. It is lined with seatbelt and stitched for extra strength. Powered by ShopFactory to sell P432 online. All-in one eCommerce and online shopping cart software.